SVG has a wealthy set of options for manipulating pictures (either drawn or bitmapped). These are options attached to the <filter> object: a bag of tricks both diverse and, in some cases, complex. Unfortunately, the filters are apparently difficult to implement by the browser developers, and so as of this writing some of the features are not implemented in Internet Explorer, a few more are not implemented yet in Opera, and fewer are yet implemented in Firefox. The development of SVG has split into two tracks – those trying to implement an acceptable subset of SVG (called “SVG Tiny”) on small-display mobile devices, and those working toward compliance with the superset, sometimes called “SVG Full”. Fortunately SVG Full and SVG Tiny are consistent with one another, so it is just a matter of making sure that the features you desire reach the audience you seek to reach, which has been the same fundamental problem with cross-platform computing since it got started in the 1950’s. SVG’s filtering options are called filter primitives. As primitives they are probably not semantically complete in the sense of allowing us to form all possible expressions (whatever that might mean in the language of imagery). They also lack the irreducibility that one often associates with semantic primitives: many equivalent results can be expressed in several different ways. Filters can be computationally quite time consuming. The larger the region they are applied to, the slower they may take to render. This is particularly relevant when one considers animating any of the attributes of these filter effects. This treatment of SVG’s filters will not be exhaustive. Let us examine a few of the filter primitives to give a basic sense of how they work and what they do. Currently much of what can be done with filters is supported by Internet Explorer (versions 6 or 7 with the Adobe ASV3.03 plugin), Opera (9.5), and Firefox (3.01). I am not sure what Apple's time frame (or WebKit's) for implementation is, nor what levels of support might currently exist in the Mobile market. The overall support within Opera and IE/ASV appear to be roughly matched with some effects available in one that are missing in the other. FF 3 introduced big gains in its support for filters, with most now supported. It seems not, at the current time, to support feFlood, feDisplacementMap, and perhaps a few others. Note that for this particular presentation, some of the examples are illustrated using SMIL animation. This is done since it shows, quite directly, the effect of varying some parameter of a particular filter. The reader is reminded that SMIL is not yet supported by Safari or FF, so you may want to use Opera or IE/ASV for maximum effect. A <filter> is applied to another object much as a clipPath or gradient – namely through a filter=”url(#filtername)” attribute defined within the object to which the filter will be applied. The <filter> tag itself must have one or more filter primitives inside it; those primitive operations will be conducted in the order they are defined, from top to bottom. Some filters are composite filters in the sense that they require the prior definition of other filters. Others are a bit simpler, in that they may be applied directly to graphic objects without advance buildup. We’ll begin the study of filters with the simpler ones: feGaussianBlur, feColorMatrix, and feSpecularLighting. Later we’ll cover the more complex ones. Now, let’s get right on to some real examples. This filter blurs an image. The parameter associated with this filter is the standard deviation (stdDeviation) which controls the distance from which neighboring pixels will be allowed to influence a pixel and hence, the amount of blurring. 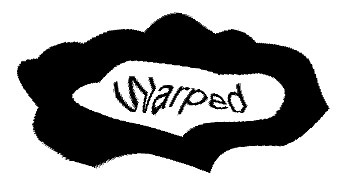 Then the <filter> is applied to an image to be blurred. <rect x="42%" y="10%" width="16%" height="25%"
On the web, here is a simple illustration of the above. The following shows the effect of increasing the value of stdDeviation on two different images on a black background. Observe that the blurred object expands beyond its original bounds and that values outside its boundary are considered to be transparent so that any background present (in this case, monochromatic black) will be visible inside the edges of the image itself. To restrict the image so it does not bleed beyond its boundaries, one can either set the x, y, height and width attributes of the filter itself (the easiest way), or use another filter primitive, the feOffset, discussed later in this chapter. Restricting the extent of a filter to the size of the source image. will blur the object only horizontally, in ways that, for a monochromatic rectangle might resemble a linear gradient with three equidistant stops. The feColorMatrix primitive allows the redefinition of colors within an image, based on the ability to multiply each pixel’s RGB and alpha levels by numeric coefficients. In the more complex situation, users may specify an entire matrix of twenty coefficients (4 by 5) to be multiplied by the one-by-four vector representing the color value of a given pixel. In simpler situations, predefined matrices have been associated with special flags (such as “saturate”, “hueRotate”, or “luminanceToAlpha”) meaning one may simply specify one of the flags to perform the indicated operation. An animated version that plays with the degree of saturation (through the "values" attribute) may be seen at this location. by an image would result in no change whatever to it. The rows of the matrix represent respectively R,G,B, and alpha, so for example, in the second image we see that the alpha channel is being positively influenced by red, blue and green, while each of those colors negatively influences itself. The result is much like a black and white negative with transparency being maximized where the original image is brightest. The range of effects presented should allow the reader, with some experimentation of her own, to get a feel for how these matrix transformations work. The values of the matrix above do not need to be typeset as they are. They could be specified simply as a space delimited string. The above format helps with legibility for both author and reader. An example on the web with these matrices applied to a base image can be seen at this location. leaves any image unaffected, since the new value of a pixel will be equal to 1 times its current value plus the sum of zero times the values of its eight nearest neighbors (those immediately N, NE, E, SE, S, SW, W, and NW of it). We might expect the above to exaggerate those pixels that are very different from their neighbors, since each pixels neighboring pixels are weighted negatively. will have the effect of striping an image horizontally (akin to applying a horizontal blur). That is because a pixel is averaged with all the pixels, within radius two, that are at the same height. The pixel itself has only a bit more weight than its horizontal neighbors. Likewise the fact that we have chosen to degrade pixels based on similarity to those some vertical distance away, means that we will tend to sharpen our horizontal edges, a bit, since those are where differences between regions are most pronounced and where pixel values will tend to be exaggerated relative to neighbors. To see the effect of these striping convolutions, let us apply both a predominantly horizontal and a predominantly vertical striping effect to the small grained fill pattern, url(#Oval), developed in the last section. The above can also be viewed on the web. 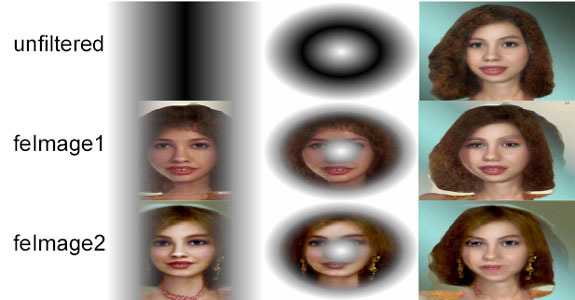 Lastly, are a series of other matrices performing a variety of image manipulations, to show not only some of the sorts of manipulations possible, but also to give some insights into how these convolutions work. 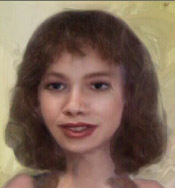 Variants of these, as well as some using animation (and compound filters) may be seen at this location. The National Institute of Health has for many years provided a freeware package known as NIH Image which does a variety of interesting image analytic operations including convolutions. The National Institute of Standards provides some informative reading on convolution filters and image processing in general. The <feComponentTransfer> primitive allows the independent redefinition of each of the four color channels: R,G, B, and A (alpha). It allows the adjustment of brightness and contrast through application of any of a variety of different functions to any or all channels of an image. The types of adjustment allowed include identity, table, discrete, linear, and gamma. 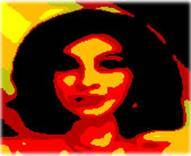 Discrete can be used to posterize an image (that is to reduce it to fewer color values). Linear is used for simple brightening and darkening (or contrast adjustment) while table can be used to remap the function (like discrete) only continuously. Here, with type=’table’ we invert the chromatic range. We take the normal range from 0 to 1 and map to a new distribution: 0à 1 and 1à 0, and all in between, for each of the three channels of the image. (0 to .25) à 0; (.25 to .50) à .5; (.50 to .75 and.75 to 1.0) à 1. The green channel is mapped to either 0%, 50% or 100% green with the threshold between these levels being chosen halfway between the endpoints. The blue channel (relatively insignificant in this particular image) is dampened to black (removing its effect altogether). The source image has no alpha channel (i.e., it is everywhere opaque), hence there is no need to modify that channel. An example of type=”linear” is displayed in the section on <feTurbulence> a bit later in this chapter. Among these filter primitives that take a simple input from a drawn object and produce a visible result effect is <feMorphology>. It is a rather simple effect, having just two parameters controlling the type and magnitude of the effect. The W3C has this to say about <feMorphology>: “This filter primitive performs ‘fattening’ or ‘thinning’ of artwork. 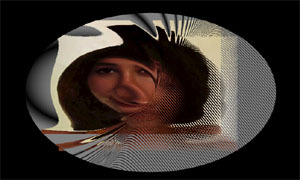 A web-based example showing the effect of animating feMorphology can be seen at this link (which runs rather slow in Opera). The filter is particularly useful for fattening or thinning an alpha channel.” A yet fancier version illustrating that may be seen here. A few interesting filters exist which do not necessarily receive input, per se, but rather can create imagery by themselves. They are most commonly used in conjunction with other filters but can be most handy when it comes to building imagery or in processing of other images. The most important of these are feFlood, feTile, feTurbulence, feDiffuseLighting and feSpecularLighting. <feFlood> gives a new way of drawing a rectangle on the screen. The difference between it and other rectangles is that it can easily be combined on-the-fly with a variety of other filters as will be demonstrated shortly. In the following example, an <feFlood> primitive is applied to each of three objects: two rectangles and an ellipse. The geometry here is worth describing in some detail so that we might be able to make some sense of the relative versus absolute coordinates so often used within SVG. Observe, in the figure above, that the <feFlood> consists of a small grey rectangle. The “x” attribute is set as 50% while the other attributes are all in absolute coordinates. When the filter is applied to each of three shapes, the rectangle begins halfway from the left edge of each. Note that the filter’s rectangle is not clipped to the shape of the ellipse it is applied to. In fact, like other stand-alone operators, <feFlood> is applied to a rectangle that coincides with the filter space – either inherited from the object (as in this case), or as applied through the attributes, x, y, width, and height in the filter tag itself. A simple working web example that works in IE, FF and Opera, may be seen here. The feFlood becomes considerably more interesting when combined with feTile – a process by which patterns (much like the <pattern> object but without actually being rendered) may be created and stored away for subsequent use by other filters. Just as feFlood allows the introduction of a colored rectangle into a filter, feImage allows the introduction of a rectangular bitmap into a filter. If for example, we wished to let each of several rectangles overlay the same bitmapped graphic, then we might filter each of those rectangles with a filter that contains the feImage primitive. <feImage> involves no parameters; it simply inserts an external image file into a filter processing stream. Because it is difficult to use the <feImage> construct without the use of multiple inputs to a filter, an example will be given under our discussion of <feMerge> later in this chapter. By varying the values of the parameters baseFrequency, numOctaves (which by default is 1.0), type (which by default is ‘turbulence’), stitchTiles (‘noStitch’ by default) and seed (‘0’ by default), we can produce numerous interesting types of pattern as shown in the following diagram (seen here on the web). In the above examples, note that as we move across the first row from A through D, we vary the numOctaves and also the seed. As numOctaves grows from the default value of 1.0 to 2, and finally to 5, the grain of the pattern becomes tighter and its fractal complexity appears to increase. The purpose of seed is to provide a different start position for the random number generator underlying the function. Note that as we move from cell A to either cell B or cell E, the transition is gradual across the cell boundary. That is, the function is continuous across these areas of the table seeded with the same random number. As we move across the boundary from B to C, where the seed changes, the function no longer appears to be continuous, though continuity is preserved (even despite the octave change) across the boundary between C and D.
The second row investigates changes in baseFrequency, which is sort of like a scaling variable affecting the size of the associated patterns. If we were to change baseFrequency through a SMIL animation (discussed later) we would see the overall pattern remain intact as it expands and moves away from the origin. Cell F has the largest grained pattern of these shown, with a baseFrequency value less than the others. baseFrequency controls, primarily, the size of the grain of the distortion map. Notice that cells G and H which share seed and baseFrequency values, but differ in numOctaves still appear to be continuous across the G/H boundary. imparting a directional grain to the pattern. 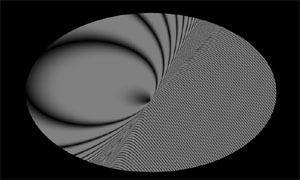 This can come in quite handy in uses of feTurbulence in conjunction with other effects, in creating striation as part of our textures. The effect of animating baseFrequency through SMIL can be seen on the web (one will note that I have also synchronized the animation of seed with that of baseFrequency such that every oscillation of baseFrequency reveals a new randomization of the turbulence map. 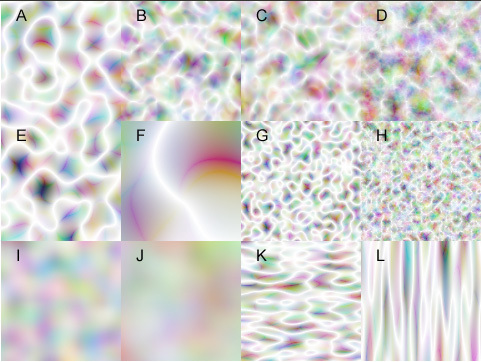 There are two values of type in the SVG 1.1 specification: type=”turbulence” (the default) and type=”fractalNoise”. In cells I and J we look at the effect of type=”fractalNoise”. The other ten cells all use the default value. <feTurbulence> used in conjunction with other filters can yield a broad range of quite interesting effects. 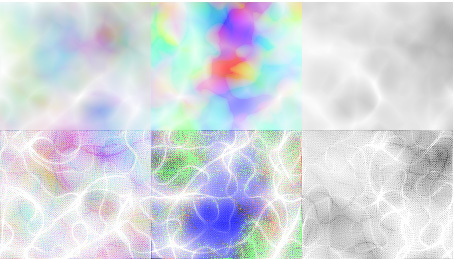 We will discuss the chaining together and composition of multiple filters shortly, but here are the combined effects of turbulence with saturation (using feColorMatrix) and sharpening (using feConvolveMatrix). Here we start with turbulence and then use a linear function to exaggerate the slope of the color values for all three channels, other than alpha, which we dampen out by letting opacity become 1.0 everywhere. Herewith two more samplings of various combined effects that involve feTurbulence. Text and oval distorted using feDisplacement applied to feTurbulence. Several copies of an image distorted using feDisplacement applied to feTurbulence. Application of feTurbulence to an image, through a mask. Base rectangle with black stroke is heavily perturned. Decorative overlays of other rectangles are also used. Much work using feTurbulence to create textures can be seen at this location. The SVG community is encouraged to suggest improvements to any of these or to suggest new categories of challenge. Numerous techniques exist within SVG for designing and controlling the placement of light sources. Many of these effects can be simulated through the overlay of partly transparent gradients, but the effects are powerful and quite useful for those who already know something of the landscape of lighting effects. Usually one will want to combine these effects using the various methods for combining multiple filter effects discussed later, but illustrated here is one very example of the use of feSpecularLighting to create an image. A more complex example (using feSpecularLighting to simulate the appearance of spotlights) can be see at this location. Two filter primitives which neither operate on raw objects, nor produce stand-alone imagery are discussed a bit separately since they can sometime provide useful results. <feFlood x="25" y="18" width="50" height="10" flood-color="yellow"
As can be seen from the above, <feTile> merely takes the imagery that exists within the filter and fills the filter space with it. This is used to move a chunk of imagery, typically the SourceGraphic or the BackgroundImage, around a bit within a filter for purposes of slight realignment. The following drop shadow result is accomplished with <feOffset>. We proceed by taking in an image and applying a blur filter. That blurred image is then offset (20 pixels to the right and 15 pixels down) and stored as result “B”. Result B is then merged under the original SourceGraphic to create the effect. The reader may view the example here, on the web. 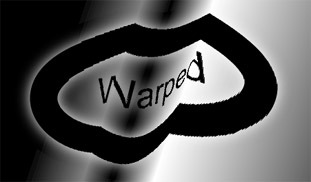 <feOffset> to create a blurred drop shadow. There are a variety of ways of combining filter primitives. One way is to apply one filter to an object, then nest the object within a <g> which has its own filter applied. In the above, we assume that filterPrimitive1 was the essence of #F1, while filterPrimitive2 was the essence of #F2. The latter approach is likely to be more efficient time-wise because it withholds any rendering while processing is still taking place. The run-time behavior of these filters can be a serious consideration, since some of the filters we have discussed in this section take on the order of seconds, rather than milliseconds to perform, at least on contemporary machines. In addition to being able to sequentially chain together the results of different filter primitives, where each successive filter takes the output of the preceding filter (known as its “result”) as its input (known as its “in”) it is also possible to combine filters in more complex orders. then it is that rectangle that is considered to be the SourceGraphic of the filter “Fs.” Each primitive in succession (FP1, FP2, …FPk), takes the output or “result” from the previous filter as if it were its input. We show two equivalent approaches the first which just uses default values of the in and result of successive filters, while the second makes all those default values explicit. There would be no reason to specify the values of in or result in the following example, but the example may help make it clear what is meant by the in and the result of a filter. In both cases, it is the final filter, from which the output is rendered into the affected graphical objects. Once we know where the SourceGraphic enters into the computations and how results are named and reused, then we are in a position to start varying the order and using those more complex filter primitives that combine results of two or more primitives, hence chaining filter primitives together in more complex and interesting ways. SVG also gives access to the graphical content underneath a given image. That is, the state of the rendered imagery in the layer below the filtered object may itself be used as a part of the filter. This allows combinations of an image with its background using techniques for combining two images: feMerge, feBlend, feComposite, and feDisplacementMap. The use of BackgroundImage to do this will be revisited shortly. The following are filters which operate on two or more images, or which utilize as input, the output of other filters. We’ll start with the simpler ones and move on from there. The feMerge filter allows the combination of filters concurrently, rather than serially (as in the earlier examples). Rather than each filter being applied to the output of the preceding filter, feMerge gives us a way to temporarily store the output of each filter. Once several layers have been created and stored as the results of different primitives, then they may be placed on the canvas in order from bottom to top. Topmost layers should have some transparency (or incompleteness) in the fill area, so as to allow those layers underneath to be visible. In the following example, we are interested in converting an image from standard RGB to partial transparency, in this case using the darkest parts of the image, so that an underlying color shines through. 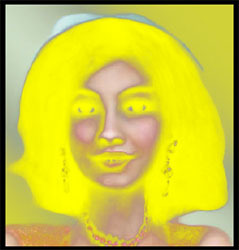 In this case, ‘yellow’ created as a part of the filter, is used. What we have done above, is to create a yellow rectangle with the <feFlood>. We then store it temporarily in the variable “A”. Next we use the <feColorMatrix> to operate on the SourceGraphic (the JPEG image). In the top three rows of the color matrix, we preserve the RG and B channels but in the last, or alpha, row, we let positive values in any of the three channels contribute positively to the alpha channel, hence creating transparency in the darker parts of the image. This interim result is labeled “B.” We then rebuild the image by laying down the interim results: first A, then atop that B. Since B is now partially transparent we may see the yellow, underneath. <feMerge> allows for any number of <feMergeNode>s to be inserted into the filter, so that we may build rather complex objects with it. The reader may realize that there are at least two other ways of accomplishing the above effect. One is to simply build a yellow <rect>, under the <image>. The advantage of the <feMerge> approach show earlier, is that it is portable. We may apply this filter to any image we wish to without having to build a <rect> underneath it. If we wish to add or withdraw such an effect dynamically, it will be much cleaner since the effect (including its color) is entirely self-contained. In this web-based version, I have succeeded in getting the feFlood merged with the feColor/matrix to work in Opera, though it works as expected in IE/ASV..
Another approach is to build a <rect> on top of the image and then using the BackgroundImage (as discussed momentarily) to “swap” the order of the two images within the filter. Here’s another example of the use of <feMerge>, this time in conjunction with <feImage>. In the above, a particular image is brought in through an <feImage> and laid down at the beginning of the <feMerge>.While effects such as seen above could probably be accomplished through other means (such as <mask> with transparency), the ability to bring an image directly into the processing stream is certainly convenient. By increasing the transparency of all or part of an SVG graphic, we allow whatever is underneath it (its background) to become at least partly visible. However the opacity of the top layer does not really allow what is underneath it to interact with it in any substantial way. Though background content may be visible, it is not available for modification or use within the current filter when it is viewed only through the transparency of what is atop it. Just as we may refer to the SourceGraphic as the object to which the filter has been applied, we may also refer to the BackgroundImage as whatever happens to be behind it. An illustration using <feMerge> may demonstrate how this can prove useful. 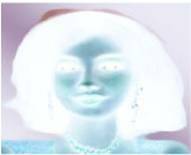 We will apply a Gaussian blur to a source image, and a slightly different blur to its background to see how this allows filters to simultaneous manipulate two images with a single filter. In the above illustration, the three vertical stripes, though lying below the SourceGraphic (the blurred white rectangle) have not been included in the <g> that has enable-background turned on, hence they are not affected by the filter #BI. 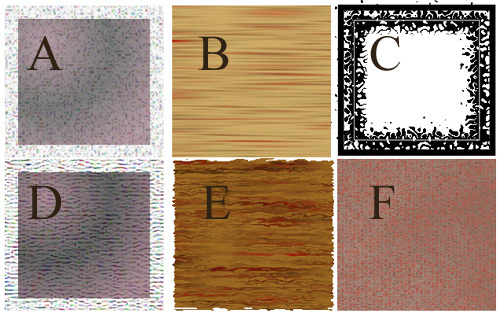 Note how the three horizontal stripes in the left image (constituting BackgroundImage) have been horizontally blurred and have been layered atop the SourceGraphic. 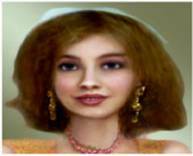 At right, though the BackgroundImage has been made accessible to the filter and a temporary image of it after horizontal blurring has been made, that result has not been shared with the feMerge and hence is discarded prior to rendering. <feBlend> is used to blend, or mix two images together with a variety of simple methods (i.e., values of the mode attribute): "normal","screen","multiply","lighten", and "darken." 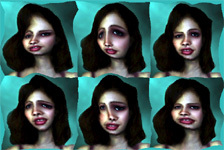 FeBlend applied to BackgroundImage using, from left to right, modes "normal","screen","multiply","lighten", and "darken." <feBlend> receives input from two sources rather than just one, allowing it to take results from other filters as well as SourceGraphic (the default) or BackgroundImage. As such it can combine quite sophisticated processes. · normal – allows BackgroundImage (or other in2) to be visible only if SourceGraphic (or other in) contains transparency. · screen – allows each image’s values to add brightness to the other. · darken – takes the darker value of the two images at each pixel. An illustration of the above may be seen here. Neither <feMerge> nor <feBlend> presents us with a way to either average or intersect two images. <feComposite> can be used for that work. It allows the superimposition of the footprints of images as well as the relative blending of their pixel values. Like <feMerge> it takes two inputs in and in2. By default, in is the SourceGraphic. The operator attribute takes values of "in", “over","out","atop","xor", and "arithmetic". All of these except “arithmetic” are simple attributes, but when “arithmetic” is specified, four other parameters are invoked: k1, k2, k3, and k4. These assign weights respectively to: a component representing the multiple of the two images, the linear effect of the first image, the linear effect of the second image, and an intercept or brightness adjustment. In the following illustration, when operator is artithmetic, then k1="0" k2="1" k3="-1" and k4="1", meaning that the SourceGraphic (in) contributes positively, the BackgroundImage (in2) contributes negatively and brightness has been boosted. Of the various operator values, “arithmetic” and “in”, probably are most useful. “Arithmetic” is useful since it allows percentage-based blending of two images (much like opacity) as well as more complex effects as shown above. “In” is useful since it constrains the presence of one image to the footprint of another, much like a clipPath, but done as a part of a filter stream. The above, together with some SMIL animation, can be seen at this location. This effect is a bit different from others in the sense that it converts pixel color values in one image into geometric distortions of another image. <feDisplacmentMap> takes in (SourceGraphic by default) and in2, and uses a specified channel (R,G,B, or A) of in2 to serve as displacement values which determine the direction and distance each pixel of in will be moved in either the x or y (or both) direction. 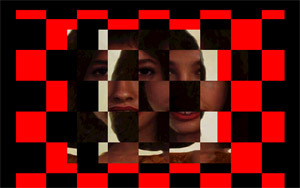 For example, if we chose to use the Red channel of in2 to horizontally distort in, and if the underlying image represented by in2 is say, a red and black checkerboard (high on Red on the red squares and low on Red on the black squares) then those pixels of in which lie above red squares will be moved to the right, while those above black squares will be moved to the left. Using a checkerboard to displace parts of an image. The scale attribute (100 in this case) determines the magnitude of the distortion (100 pixels). A value of zero would mean that no displacement of pixels will occur. Animated versions which animate the scale attribute (and hence the magnitude of the distortion) may be seen at this location. or here. The fact that we used both red squares and the red channel is really unimportant. Had we used white squares instead of red, the result would have been the same, since the Red channel will be just as strong atop white squares as atop white ones, since white, restricted to the Red channel is “#FF” which translates to 100%. Clearly this filter primitive has lots of potential for creating interesting effects with various warping gradients. The following example uses an underlying reflected gradient. We may use <feDisplacementMap> to define distortions that go beyond those allowed by the isometric spatial transformations: translate, rotate, scale, and skew. Based on continuous radial, and linear gradients, particularly as enhanced by <feTurbulence> it should be possible to build warps of almost any kind desired. Some text and an ellipse warped through <feDisplacement> by a rotated linear gradient. A perhaps tighter use of the term primitive may be seen here “The extraction of a minimum set of semantic primitives from a monolingual dictionary is NP-complete.” David P. Dailey. To appear in Readings in the Lexicon, edited by Yorick Wilks, MIT Press, in press 2007. The filter gets its name from the mathematician Carl Friedrich Gauss (1777-1855) who contributed much to the understanding of parametric statistics. The normal curve or bell curve is sometimes called a Gaussian distribution. Specifically it lets each pixel value in the new image, be determined not only by its own value, but by the value of its neighboring pixels with weights determined by a Gaussian curve. Should we wish for the layers to be combined not only concurrently, but also within the same layer, then we may consider either feBlend or feComposite, which offer richer ranges of possibilities. In the above example, the statement in=“SourceGraphic” can be removed without changing the results.